Babies are only small for a very short time, and sometimes my little man looks ready to run off to the park with his friends, or ride his bike round the garden even though at 6 months he can't even crawl. Today we took what I consider to be a major step towards growing up, and put Dylan in some shoes. To some this may not be a big deal, but I have always thought that babies do not need shoes until they can walk. Their feet do not touch the ground! Booties suffice to keep their little tootsies warm, and as much as I love to dress him up, his comfort is my top priority. I don't know what age it becomes inappropriate to dress a child in just a sleep suit all day but I fear Dylan is nearing that age. 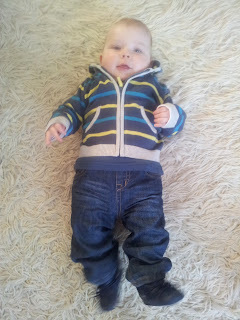 He usually wears 'proper' clothes, but we like denim to be soft and lined, and tops to do up under the nappy with poppers. I like my baby to look like a baby, and more importantly to be happy and comfortable. Children grow up too fast without our help, so shoes are going to remain for special occasions only until he is toddling. I agree that babies don't need shoes, and Bubby D doesn't usually wear any. Partly because if I tried to put them on her, they're fairly likely to fall off, and partly because I never think to put them on her in the first place! It's a shame really as she got given lots of really lovely little pairs of shoes when she arrived (as opposed to her older brother - people seem much more inclined to give shoes as a present for a girl) and some of them she's never worn and is already too big for! The only things that she does wear sometimes is a little pair of soft furry boots, to keep her feet warm if she's in the sling and not wearing her snowsuit.